Updated Monday April 8, 2019 by GSLA. Thanks for your patience as we sort out the best evaluation schedule for players this year during the week of April 15-19, 2019. The schedule describing the time, location, and group (organized by first letter of the child's lastname) to attend evaluations. The purpose of evaluations is to promote balance in the teams. Please try to attend at least one of your assigned floor times with an understanding that AAA hockey tryouts coincide with evaluations on this week. Please note: this schedule is only for evaluations. Children can wear all of their equipment as well as any hockey/lacrosse jersey they have at home. They will be given pinnies during the evaluation floor time. 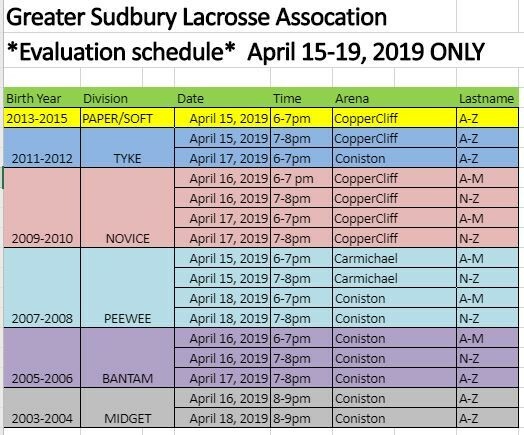 The weekend after evaluations there will be team drafts and a full year schedule will be emailed to parents by the end of the day on Sunday April 21, 2019.